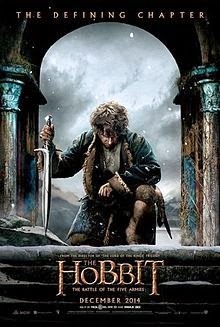 The Hobbit: The Battle of the Five Armies is an upcoming 2014 epic fantasy adventure film, directed by Peter Jackson and written by Jackson, Fran Walsh, Philippa Boyens, and Guillermo del Toro. It will be the third and final installment in the three-part film adaptation based on The Hobbit by J. R. R. Tolkien. It is preceded by An Unexpected Journey (2012) and The Desolation of Smaug (2013). Produced by New Line Cinema, Metro-Goldwyn-Mayer and WingNut Films, and distributed by Warner Bros. Pictures, the film is scheduled for release on 12 December 2014 in the United Kingdom and 17 December 2014 in the United States and the first teaser trailer was first released at the San Diego Comic Con on 26 July 2014.